For this particular body butter we're going to be using one of my all time favorite natural moisturizing ingredients, raw African Shea. One day last year it dawned on me that every single product I ended up falling in love with and using the most contained Shea. If a little did wonders what magic could pure Shea without a bunch of questionable additives do for my skin? I had often seen it being sold at the local farmers markets but the lines were always insane and I was slightly confused and concerned as to why some of it was starkly white and crumbly while others were bright yellow. After doing some research (and being snowed in) I decided to order some online and take my chances. 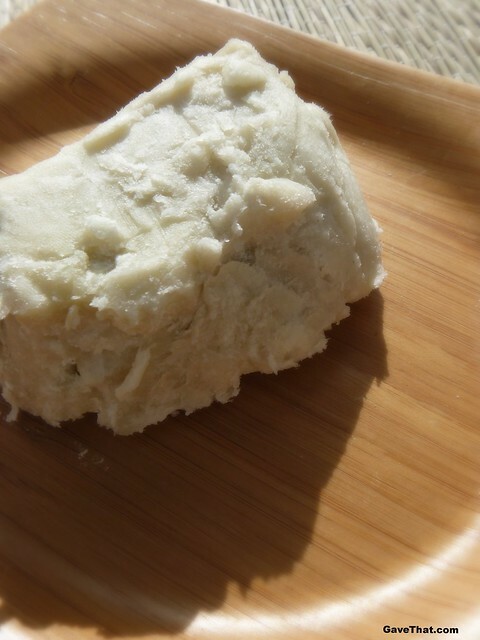 A few things I learned about picking out Shea butter is that there are definitely adulterated products (namely the addition of an herbal root powder called Borututu to give a golden color) and complete counterfeits ranging from another bright yellow African tree nut butter called Kpangyan to lard and palm oil. Sight alone is usually not enough when trying to pick out a good Shea as, depending on where it was grown, it can vary greatly in color although when I saw a Ghanaian women demonstrating how she made her raw Shea butter the color right from the nut was an off white or ivory color tinged slightly with a yellowish green. She let us touch and smell it which left an indelible mark. That color, texture and smell is what I would always look for and thankfully found in the Shea above. Along with the color which can vary from white to gold, the scent and texture are the best markers. Shea has a very buttery almost Playdough feel that is also tacky if you pinch it between your fingers. The scent is also rather unique and similar to, in my opinion, something smoky and nutty mixed with rubbery Oud. Others I let smell it said it was sort of bitter and how chocolate or coffee smells when it's being roasted. It's definitely one of a kind but distinctly different from a rancid smell. Another problem sign can be a gritty texture which might mean the Shea is old and gone off or it was heated too much and refined, both of which causes it to loose it's antioxidant benefits. The crystals usually melt from a persons body heat but it can make your body butter loose it's creaminess. A soft, smooth Playdough texture is best. 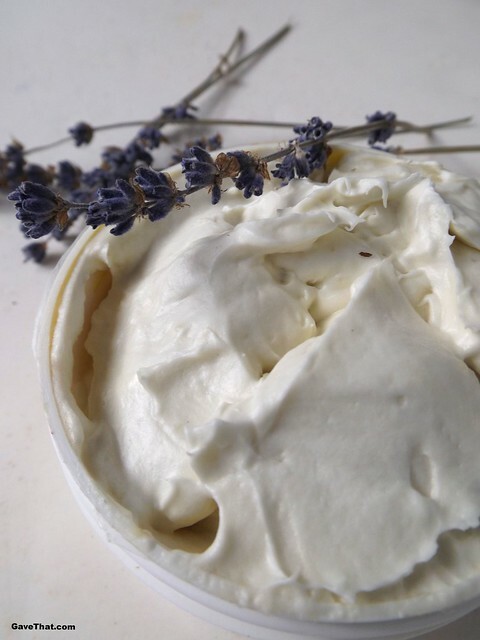 For a simple raw body butter all you need is Shea and a little pure essential oil of lemon or you can follow the recipe I used here. 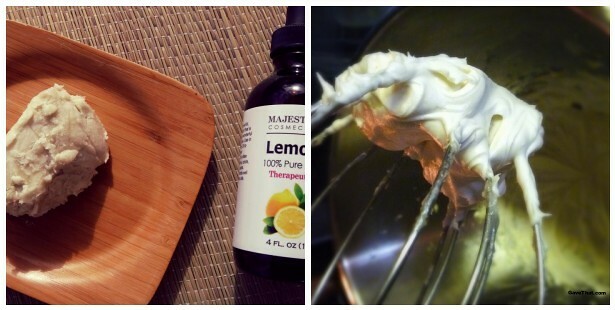 The most important part is aerating your body butter by whipping it much the way you would make meringues. I placed everything in the KitchenAid mixer but a handheld mixer or even an eggbeater would work. Start slow and increase the speed until it reaches your desired consistency and frothiness. Mine took about 8 minutes. Adding gently warmed coconut oil also helps any harder lumps of raw Shea to incorporate and chilling in the fridge, in-between beating, can help your body butter firm up if you're making it on a hot summers day. Feel free to add more essential oil or to completely change them based on your tastes in order to mask the scent of Shea and add healing properties. I love the way this lemon essential oil by Majestic Pure made this butter smell like a trip to the sun drenched Mediterranean. Find it over here on Amazon. Two other essential oils that actually work really well with Shea's smokiness is vanilla and coconut. Don't have any essential oils on hand? Pure extracts used in baking work great too, especially if they're alcohol-free. Try vanilla, orange or lemon. To finish up I transferred the body butter to little tubs decorated with a band of washi tape. It all literally took ten minutes. 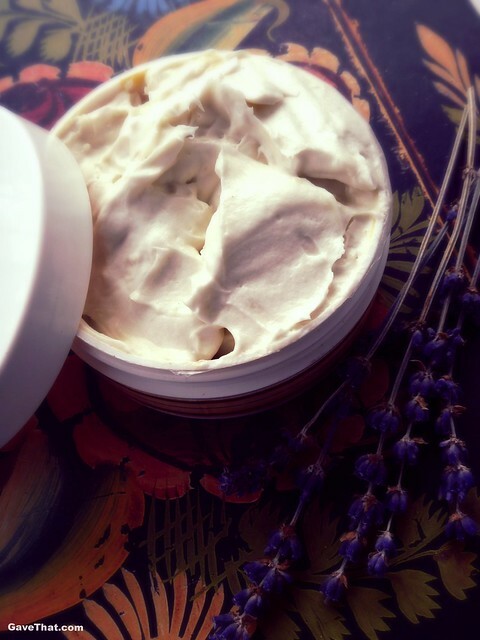 The result is a rich, marshmallowy cream that melts right into the skin, leaving behind a moisture barrier that makes a world of difference to chapped hands and a baby's little bum. A little goes a long way too so you'll have plenty to dole out as gifts to friends.